You should be, happily, in just-in-time tracing land. It’s still buggy (hence the reason for hiding behind the preference wall) but it should be good enough to handle most web sites. What’s especially exciting is that this code is working on x86, x86-64, and ARM – which means that these improvements won’t be limited to just the desktop – you’ll be able to receive them on your mobile devices as well. In simple terms tracing works by watching for commonly-repeated actions (such as loops, function calls, or type checking) and tries to optimize their resulting native code into the lowest number of actions. The premise is rather simple – and it’s an advance that we’ll probably see proliferate to many interpreters and engines in the upcoming years. Andreas Gal published a paper (PDF) on the subject and Brendan Eich has written up a TraceMonkey-specific explanation. Function Inlining: Removing the overhead of function calls by simply replacing them with their resulting native code. Type Inference: Removing checks surrounding common operators (like “+”) when the types contained within a variable are already known. This means that the engine will have already pre-determined, for example, that two strings need to be concated when it sees the “+” operator. The code for this project has come from a number of places – one of which is coming from some code contributed to Mozilla, from Adobe: Tamarin Tracing, specifically the nanojit code that’s able to work a lot of this just-in-time magic. The work began just about 60 days ago, working with Andreas Gal of UC Irvine, to integrate the nanojit technology into Spidermonkey. You can hear more about the development from those that were involved: Andreas Gal, Mike Shaver, and Brendan Eich. The full code can be found in the TraceMonkey mercurial repository (the commit to merge TraceMonkey into Mozilla core is massive, clocking in at about 4MB). If you want to try running your own copy of TraceMonkey on the command-line, just follow the steps outlined here. There is still a ton of work to be done. The incredible speed-ups that we’re seeing are only just the beginning. A lot can be done to improve how registers are currently being allocated which will provide even more speed-ups. How’s the performance compared to WebKit/Squirrelfish? Nicely done. I hope this will force everyone to give us near native perf for JS. This is going to be great. Thanks. @Steve Streza: Well, considering that Squirrelfish was “only” 46% faster than Firefox 3 at the SunSpider test – and the current TraceMonkey code is already 83% faster than Firefox 3 – it’s pretty safe to say that TraceMonkey does to Squirrelfish what Squirrelfish did to Spidermonkey. It’s a game of leap frog and we’re seeing tremendous results. I just can’t wait to see these improvements and especially when the DOM improvements arrive! OMG!!! this is just great! Would it mean a K.O. for squirrelfish? Although JS is never going to replace the server-side website completely, not if you care about accessibility anyway. These are amazing news. Firefox 3.1 is going to be really incredible (at least for developers). current version seems to be mangling matrix math in dojox.gfx. Can’t wait for this to solidify. 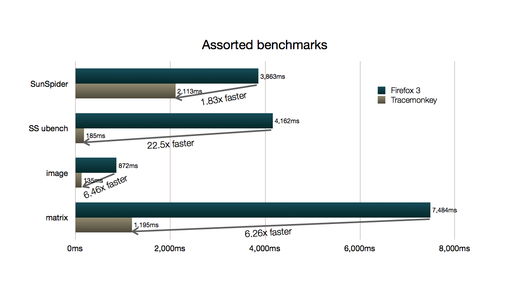 I posted some benchmarks of TraceMonkey versus SquirrelFish on my blog. @Adam Sanderson: Tamarin-Tracing is the Tamarain ActionScript virtual machine with tracing support built in to it. Both Tamarin and Tamarin-Tracing were donated by Adobe to the Mozilla Foundation. @Rizqi Ahmad: I wouldn’t go that far. I fully expect that the WebKit team has a few things up their sleeves and that they will respond in kind. I wouldn’t be surprised, at all, to see them re-leap-frog us again and see the competition resume. This is a healthy competition where the true winner is the users of the web. @Michaël Lecerf: Correct, that is the hope! Nice work! Having built a couple of compilers and bytecode engines in my life, I know how freaking hard stuff like this is to get working. Hmmm…. what else happened in 3.1? I can barely get much code working even with JIT turned off. @Steven Roussey: How do you mean? Are you getting errors with sites, or extensions, or …? Thanks for sharing, John. This is indeed exciting. Congratulations to Gal, Eich, Shaver, yourself, and the whole Mozilla team! And thank-you to Apple (and Opera) for keeping things competitive. @Steven Roussey: You’ll probably need to restart the browser after you’ve turned off JIT-ing. I just visited your site in the nightly and got no errors. Oh, not my link! Haha.. no JS there at all! u:firebugbug and p:firebugbug (these where used until recently for the firebug devs for FB Issue#1029, now closed). Click on the “Theme Editor” and then General:Boxes. Well in Minefield, nothing shows as there are JS errors. I’m currently trying to figure out why… Fx3.0 it normal, but they show one at a time (though quickly). In IE and Safari they show up all at once. BTW: If a cookie named “debugjs” is set to “true” it won’t give the compressed version from the CDN. I’m confused, to me it sounds like it is just making the interpreter do what the coder should of already done. Eg. Or is my interpretation quite wrong…? @Benjamin: It’s much more complicated than that. There are all sorts of checks going on in the background (loop overhead, type checks, and function calls) that you, the user, have no control over. Tracing completely optimizes these items out by knowing what the actual values are supposed to be or what functions will be called. It’s much faster than anything that can be done manually by the user. Benjamin, it’s making the interpreter at runtime convert to native machine code. How will Internet Exploder 8 stack up to Firefox and Safari in terms of JS speed? It’s great that modern browsers are improving in leaps and bounds, but there always seems to be IE dragging everything back in to the dark ages. @Guy Fraser: Internet Explorer 8 beta 1 still lags far behind Firefox 3 on performance tests. We’ll have to see if beta 2 makes any improvements upon that. Very impressive news! Will try to build and play. This is great! Will this make it into the 3.1 release? Regarding canvas performance, it likely helps the “loop over pixels”-things most, i.e. custom blending operations and such. Canvas scene graph performance – probably SVG animation too – is mostly constrained by GC and canvas drawing ops. Doing a few thousand 3×2 matrix multiplications per frame (for a complex scene) takes a fraction of the total frame time. Physics and other number crunching should benefit though. Many free software or open source projects have been accused of NIH syndrome because often several projects aim to accomplish the same things. For example, there are literally hundreds of Linux distributions. Each ostensibly has a different set of goals or target audience, but in reality most of them end up being nearly identical. Why did Mozilla not cooperate with the Java-community who has experience in JIT-technologies since a decenny? Ulrich Weber: Tracing JITs (tracemonkey, tamarin-tracing, luajit2, hotpath) work in quite different ways from hotspot or other similar JITs, and have different design targets. Mozilla instead collaborated with Adobe and several other groups and people who have more experience in this area. I think you have a typo in the 4th to last paragraph. From what I’ve read about the subject it seems be a win-win, it’ll take a bit more memory to create the temporary traces and will consume a bit more of CPU cycles (or battery watts) to compile the code. But overall the gains will be far greater than the overhead. One extreme case I can think where it will penalize is on self modifying code when using the eval() function. Even then, if the code evaled is doing an expensive loop I assume it’ll also be optimized. Does this mean that firefox will be faster on ubuntu? Cause firefox 3 is really slow atm on ubuntu..
A JIT is a JIT. Mozilla’s JIT-technology is not totally different from existing JIT/Hotspot-technologies. And in 2 months you can’t create a new complete new wonder-technology. The Java-community has more then 10 years experience in creating JIT’s. Reading planetmozilla today was like having a flashback to 1999. Did Mozilla never investigate existing JIT/Hotspot-technologies and especially a cooperation with IBM and Intel for project Harmony? Mozilla reinvents the wheel. I’m a Firefox-user and advocate so-to-say. But your (sorry!) stupid NIH-mentality is quite irritating. OpenSource projects should cooperate and share resources. Do you have the same financial and human resources like IBM, Intel and Sun? Or Microsoft? Off course not… but you just reinvented the (JIT-) wheel for the sake of reinventing the wheel. And what’s about the next generation of massive multi- and manycore processors? Do you have the resources to get it done? Ulrich: You’re ignoring what I said (btw, I’m not a Mozilla developer). Mozilla didn’t reinvent the wheel, they just didn’t use the wheel you like. They used a different wheel. Ulrich: Andreas Gal uses HotSpot in his research at UC Irvine. He not only benchmarks against it, he and his colleagues have built a Java-based tracing JIT on it, and they have had to work around its lack of a JIT API (reverse engineering its GC write barrier, etc.). You should not assume that any of us is unaware of the work Sun (Anamorphic really, originally) did there. Oh, and Sun has not open-sourced HotSpot either, so I have no idea what you think we should have used that was invented over there. Even if they had, HotSpot is a giant beast that focuses on server workloads. No way would it fit, or its startup or compile times be tolerable, in Firefox. Why not take a breath and then tell us what specific Invention we who created TraceMonkey rejected because it was Not from Here? Do a little more research, yourself. See the Franz & Gal papers — they cite all their references and credit prior work; they pass peer review. Unfortunately, the web isn’t exactly SpecJVM98. SpecJVM98 runs a few minutes on a fast machine. Most webpages don’t take that long to load. In fact, for a lot of code we compile (including the infamous SunSpider benchmarks), we see runtimes in the ballpark of 50-100ms in the interpreter (5-10ms with JIT enabled). Thats precious little time to do traditional method-based compilation and SSA-based optimization. If you are interested in the details you can take a look at my dissertation, but essentially graphs are more difficult to optimize than linear sequences of code (traces), and whole methods are usually graphs. Trace compilation takes advantage of the lesser complexity of traces and is very fast and hence better suited for low latency compilation. As a ballpark number, our Java trace-JIT was 350x faster (compiling) than Hotspot (client compiler, not even the optimizing server compiler). I think thats a strong argument in favor of trace-compilation for web content. And as for collaborating with other companies, Adobe is the main author of, and Intel a regular contributors to, our core JIT component (nanojit). ARM has also been contributing to nanojit recently. Without all this support and Adobe’s code donation (Tamarin and nanojit) the Tracemonkey project would have been impossible. Most of Mozilla’s money comes from Google. But does Google use Mozilla’s JIT-technology for Android? Google doesn’t even use Mozilla for Android’s browser. They decided to use Webkit. Not exactly good news for Mozilla. Hopefully Google will be more intelligent then Mozilla when it comes to “jitting” Webkit. I don’t see how any of this helps anything. The biggest problem with tracing monkeys is getting the little buggers to hold still under the paper. Oracle developed a great monkey clamp for just this purpose, but Mozilla won’t use it because of their are Communists, and Opera implemented all this 7 years ago FACT! You couldnt make it up!!!!!!elevenone!! @Armin: don’t feed the trolls (I did once but never again). Might be interesting to see how processing.js looks with this. I’m really impressed by it and it’s the most computationally intensive JS I’ve seen. Ilene Jones, 100% agree with you since a week i only focus to optimize my code on IE, i reach some good result now ( of course always 3 to 5 times slower than FF ). I will convert people to FF no worry, my target is power users so not a big deal. This is great news. Do you think it will be enabled by default when 3.1 lands? What about the chrome and DOM? Just tried it and the image editing demo is about 3x faster with TraceMonkey in a WMware virtual machine than FF3.0.1 is on the host! Also it’s worth noting that the about:config pref change is real time. Why no benchmark for Dromaeo? That’s what I usually use for comparison. IE blog annouced they got great improvements in Beta2. & Because of tracemonkey, It’s time to use canvas now. But, canvas is not good at event handling and it must improve its preformance also. Do you think we should use a native GL like syntax API for web app? I’m really focus on the DOM performance. Is there any dom fast access / GL accelerated backend news? Update: something in format-tofte is 180x slower with JIT enabled! It’s the darn arrayExists function to check if the function exists. It’s much quicker, if you change it into a hash of the functions by name, and check for non-null before you execute them. When I read your claim it sounded strange to me. I believe the source has been released as GPL+classpath-exception for quite some time now. the benchmarks are quite impressive! I really wonder how long IE will exist, since FF is getting better and better and more and more people know about it. I have several questions to the authors of TraceMonkey. tracer JIT in TraceMonkey is absolutely useless, and in fact the performance of it will be slower (due to tracing overhead) than even pure interpreters such as SpiderMonkey and Squirrelfish (and way slower than V8)? no JIT-generated code nor tracing information will be saved between successive calls to execute()? 3. What about JIT support for other processor platforms, besides currently (as far as I understand) supported x86-32, x86-64 and ARM? Specifically, POWER and Sparc? PA-RISC and Itanium are less important but interesting too. Why not JIT everything? Why not compile the whole thing upon first execution and cache the result for later? This is something that has bothered me in java hot-spot too. 1. 100,000 lines of generated code like that won’t be traced, but then you don’t want to ship that down to every user anyway. But you’re wrong to think there’s tracing overhead. Tracing only starts when a loop is seen. And our interpreter performance is increasing as I noted — see Dave Mandelin’s blog. Inline+call-threading is what SquirrelFish is now using, and close to what V8 does. 2. Trace trees are saved between executions, in that code cache I mentioned. 3. Care to contribute ports to those CPU architectures? I have others interested in using such ports, but we need hackers to do the work. John, how big is this tracemonkey repository. I am into 77 MB of the download with the .hg directory still being filled.